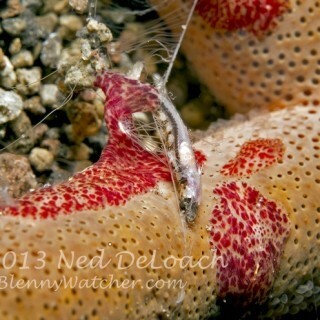 Three years in a row in the same spot – is it the same eel? I visited a Chain Moray, Echidna catenata, that has been in the same spot for the past three years, always tucked into the Orange Cup Coral, Tubastrea coccinea. I don’t know if it is the same moray every year but it is the same dock piling, and the moray is always up high, in 2 feet of water. Seas were still a little rough from a passing storm, but I couldn’t resist nosing in under the dock to see if it was there. 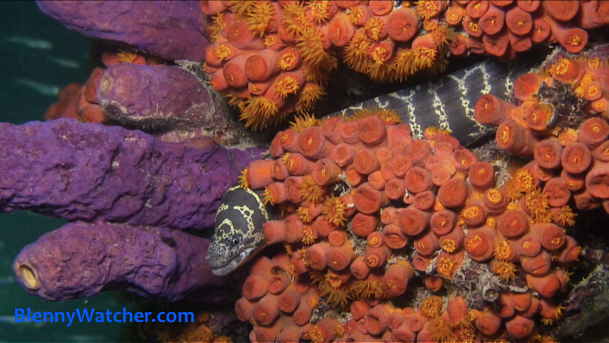 The eel watched me calmly as I bobbed around in the surge trying to capture a few seconds of video. An advantage to visiting the same place year after year is getting to know what fishes tend to favor certain habitats. 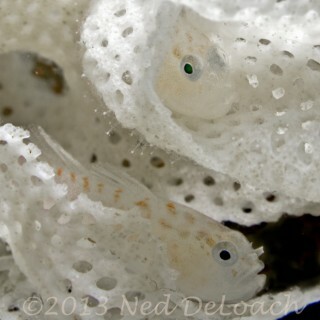 We always find a colony of Cherub Fish, Centropyge argi, in the rubble at about 70 feet. 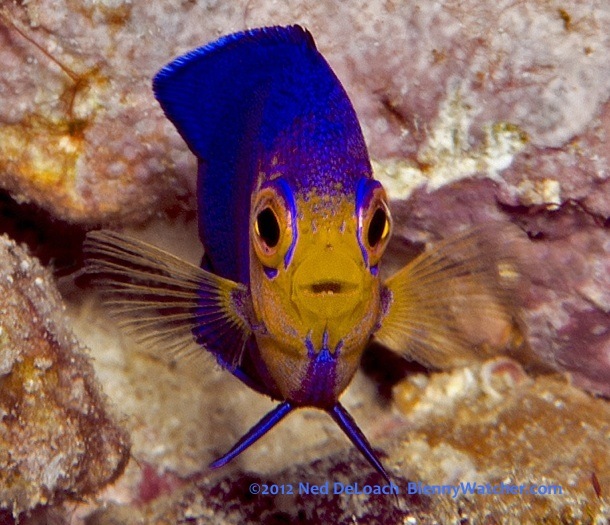 Cerubs are the smallest of the Caribbean angelfishes and tend to be very shy, darting out for a few seconds at a time. I love that you can even see the tiny teeth in Ned’s portrait of this little 1-inch fish. 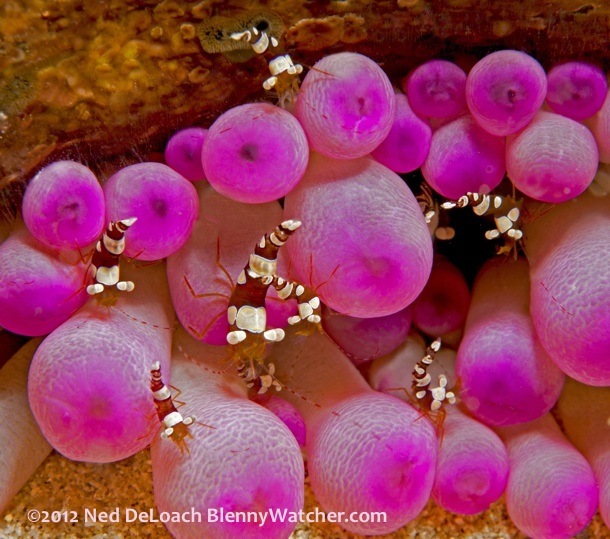 Anemones are fairly common, but this brilliant pink Giant Anemone, Condylactis gigantea, was so pretty and its resident population of Squat Anemone Shrimp, Thor amboinensis, were perched out in plain view. Night dives here can be amazing. 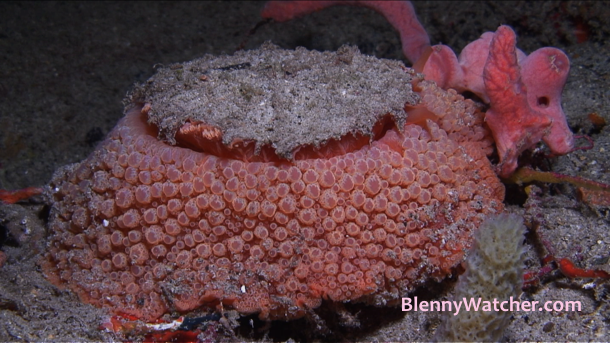 Our friend Ellen Muller showed us this Umbraculum (Umbraculum umbraculum), one of four that we saw over one dive. The Umbraculum, a.k.a., Umbrella Shell, is a fairly large (10 – 12 cm.) mollusk, with a flat, encrusted shell on top that makes it very difficult to see when buried. The first we ever saw was years ago here on Bonaire. 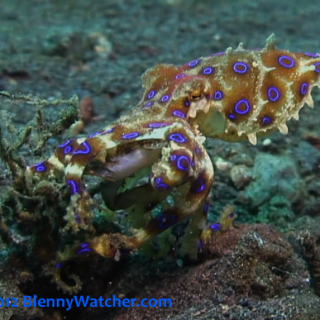 Although we have seen them since in Lembeh Strait, this night’s were the prettiest. They had surfaced to feed on sponges. 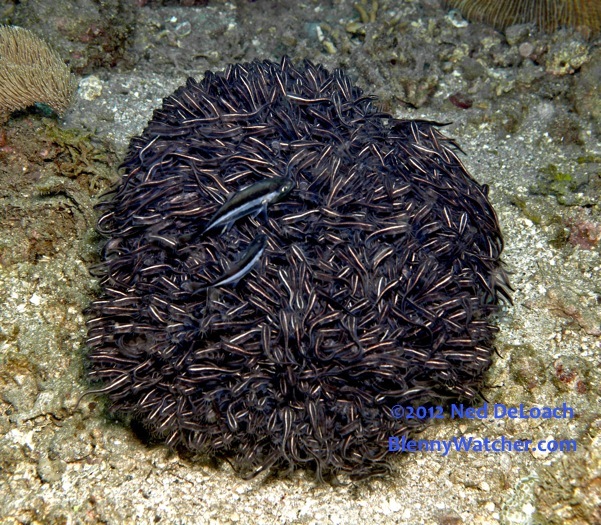 The Sea Slug Forum has a good write up about these very cool animals.